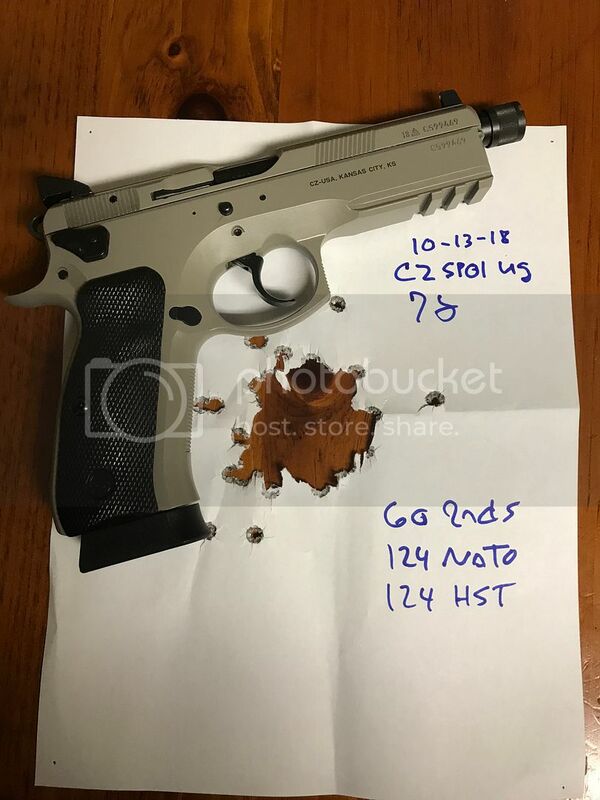 I had CZ handguns back in the late 80’s, but hadn’t shot one in years. I played with a PCR with the CGW Pro package and simply had to have one. Pick it up on Tuesday, new sights already installed, just waiting on the LOK grips to show up. I will do a range report after next weekend. ** I picked up my PCR today and ran back to the ranch and put a quick 100 rounds through it. I like it a lot, the CGW action components and my gunsmiths polish work makes far a silky smooth action. Double action came in at 7.75lbs and single at 3.75lbs. I had 4 light primer strikes until I realized I was riding the decocker with my support hand thumb. I think the thin grip will help that issue along with range time. My groups were not the best, then I discovered my rear sight was loose and sliding back and forth. That has been corrected so we will see what happens with the new grips and stationary sights. I will do a full report with pics in a few hundred rounds. I suspect you're definitely going to love the PCR. 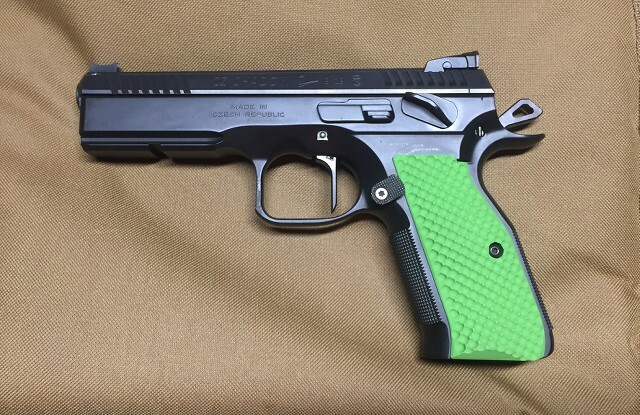 It is only slightly lighter than the 75 compact since it has the aluminum vs steel frame of the 75 compact, so it will still be a very easy shooting pistol. Absolutely love the 75 Compact I bought for Christmas as mentioned in my thread. Fits my hand perfectly and shoots awesome. 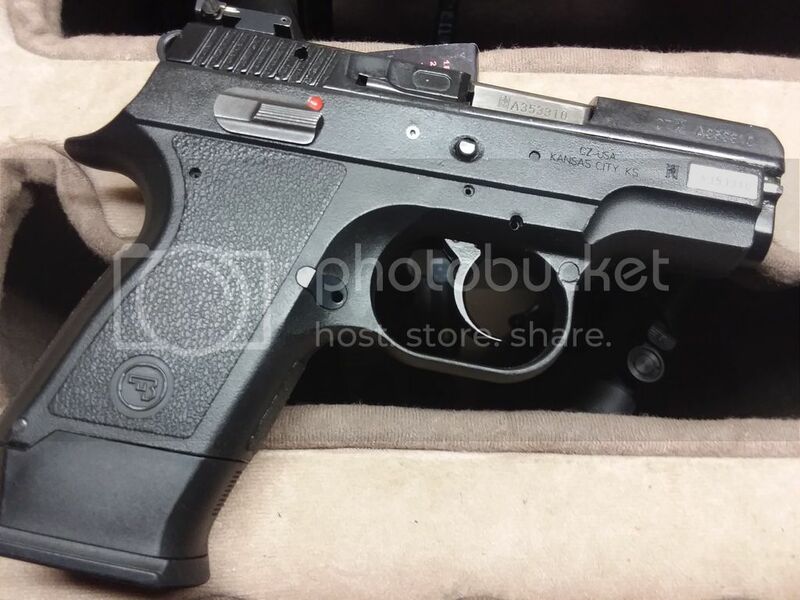 Great ergonomics, nice trigger, very accurate, reliable, and heavy duty construction. CZ pistols are easy to like! Here's a 7 yard target shot with my 75 Compact two hand standing the first time out (50 rounds). Not slow, not fast, just a long enough pause for the sights to come back down with the front sight back on the bullseye for a brief moment of front and rear sight alignment. You’re going to love it! I bought my first CZ last Feb because I’ve always wanted one, and bought my second CZ a couple weeks ago because I liked the first one so much. I will most certainly buy more CZs as time goes by. 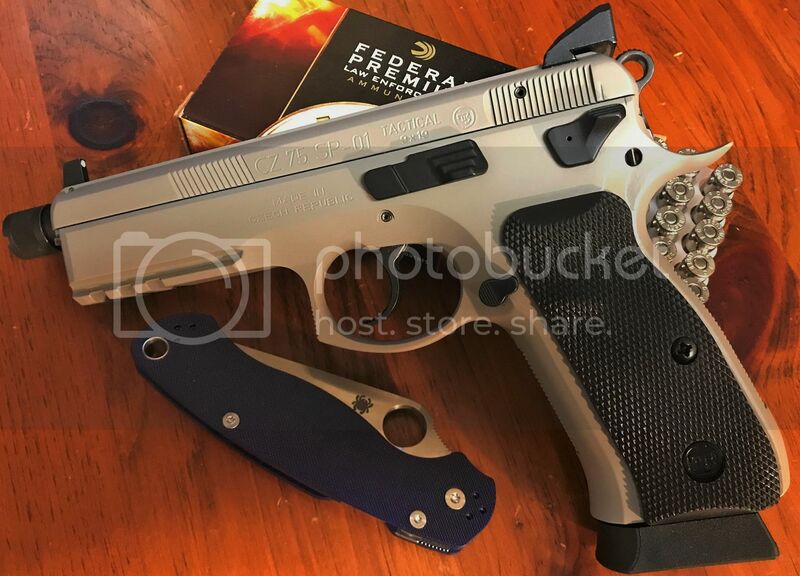 Enjoy your new CZ and let us know how it does for you. 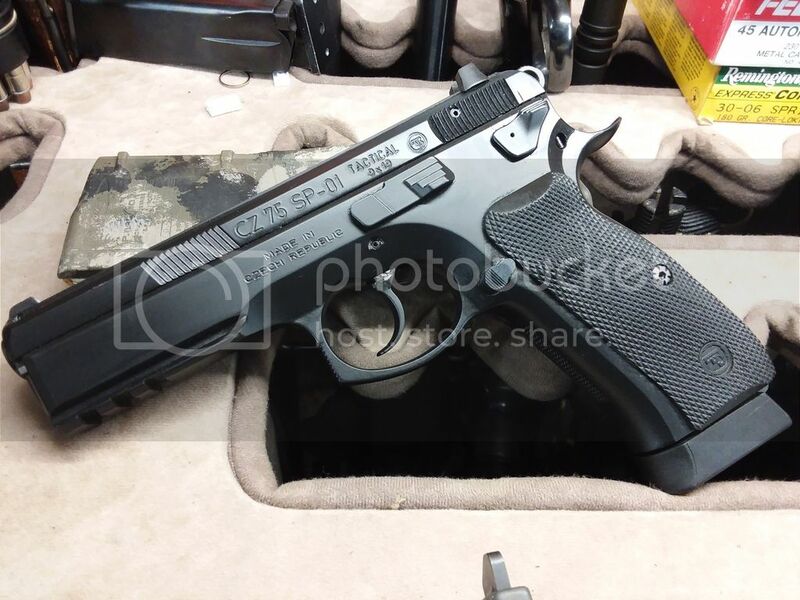 I for one can’t wait until the CZ75 A01 is released = an upgraded CZ75 compact with bull barrel, custom trigger and sights. I recently picked up a Shadow 2 to start USPSA production shooting. Have several hundred rounds through it already. 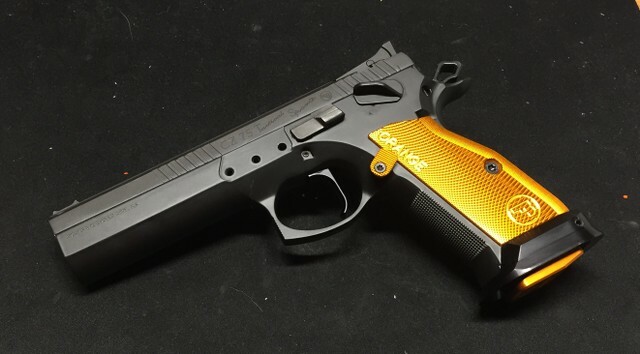 I'm still a Sig guy but this CZ is sweet. 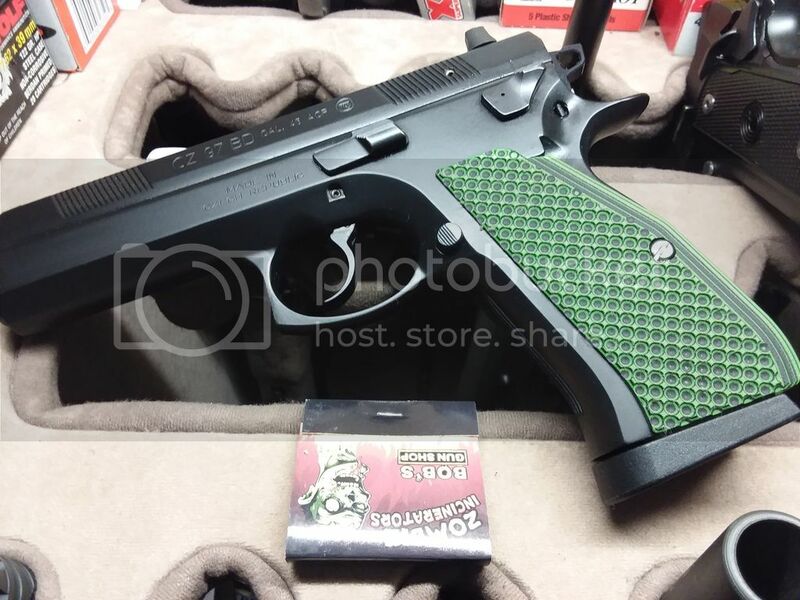 Its also a great range gun, plinking, varmint shooting and fun on the steel plates. Heck, it would be a great home protection weapon. The only thing it would not be good at is concealed carry, its very heavy. This 97B is my fave! So thin for a double stack 45! Ooooh! The 97B!! That one is my favorite as well. Shoots almost as soft as a 9mm. A 97B with LOC grips...aka my zombie gun with CGW hammer and some other parts I've forgotten about. and my first CZ. I will never get rid of it! +1 - I love my 97B. One of my favorite guns! A pair of RMR'd P-09's for me. 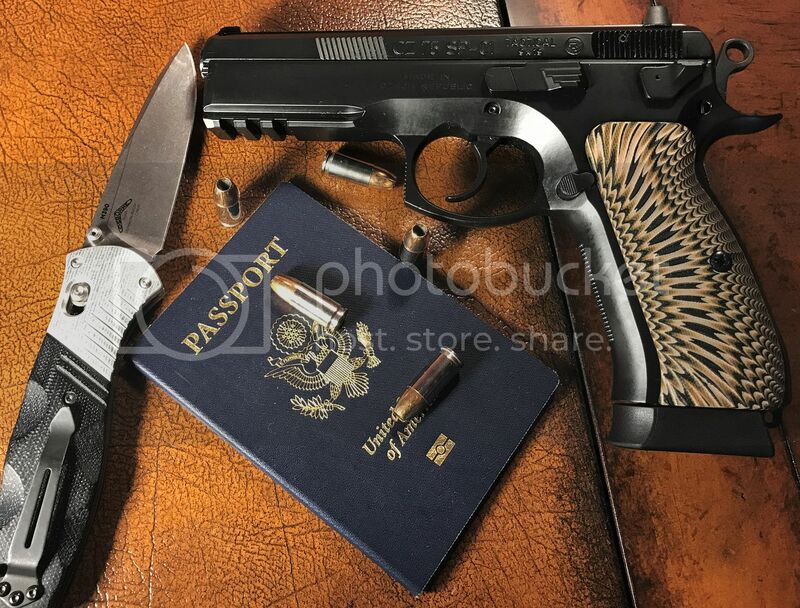 CZ Tactical Sports Orange in 40 S&W in top photo. 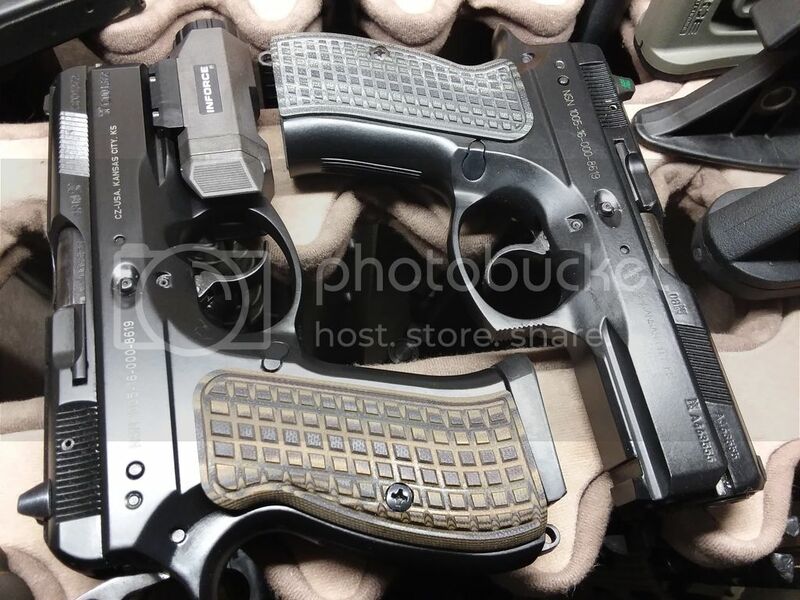 CZ Shadow 2 in bottom photo. Converted to SAO. I’ve got a pair on Matrix thin and crosscut regulars coming from LOK. I want to see what width feel the best for carry. I can’t wait. I really want a Tactical Sport Orange!!!!! 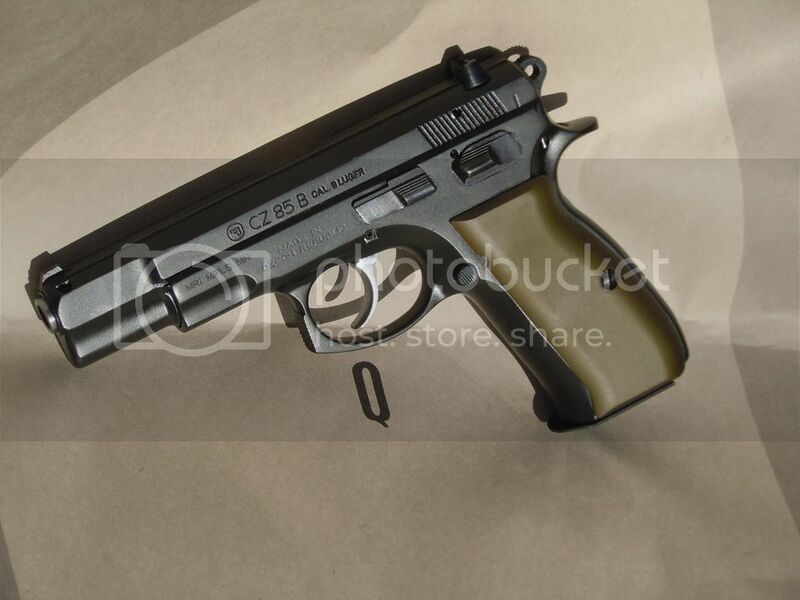 CZ makes a great pistola!! 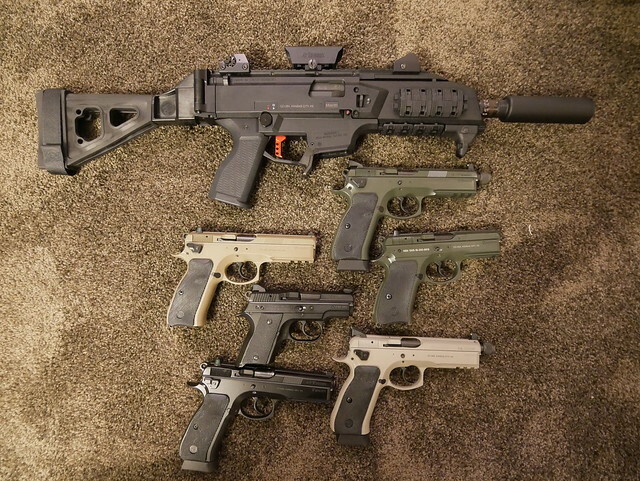 very nice guns for the price.my cz collection has passed my sig collection. 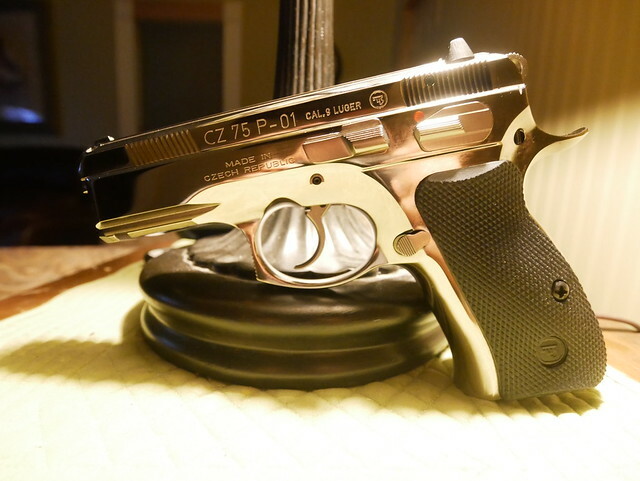 the polished p01 hasn't been fired , being so rare. the only gun I own I haven't shot and probally won't, probally. Had this poly 40 but swapped it. 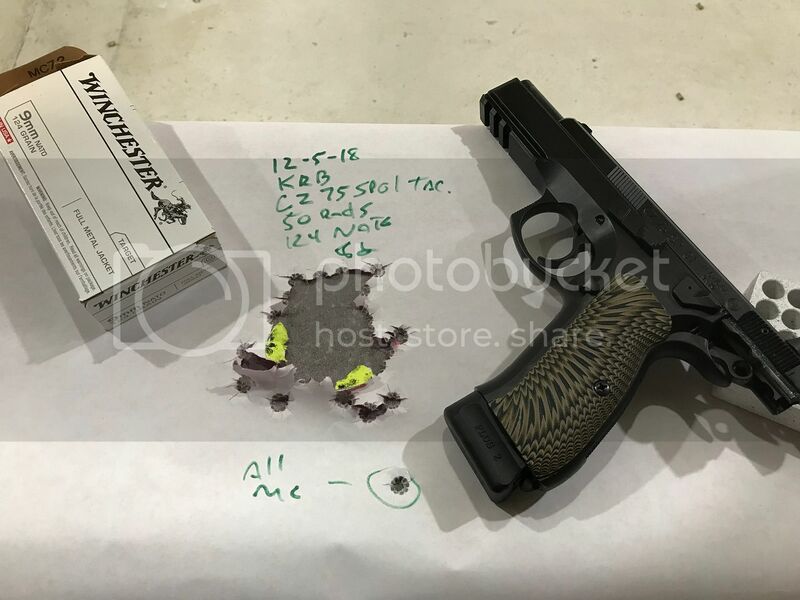 It was one-hundred percent reliable through just a couple hundred rounds which surprised me based on others results. Still have a 40B though that needs some tuning. 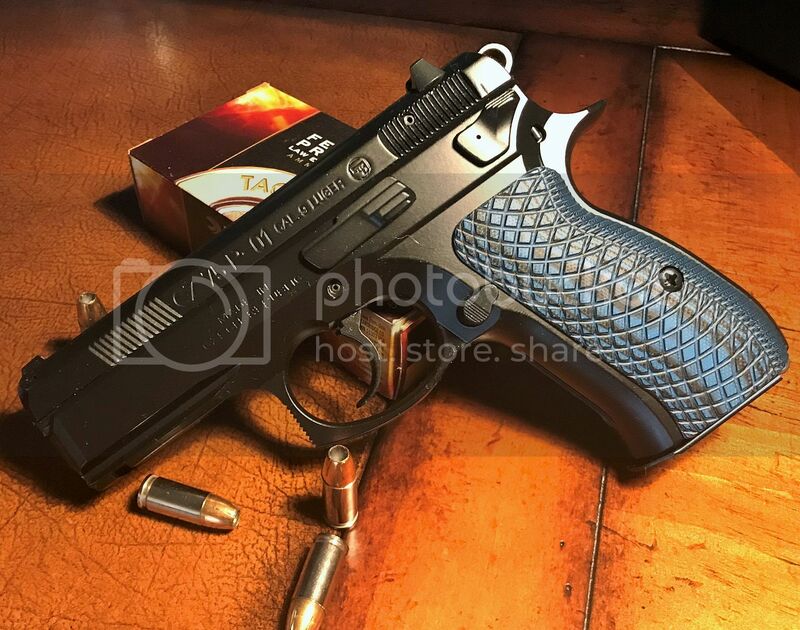 What are the blue / black grips on the P01? They are very nice. Some really nice pics in this thread. Starting to get the CZ bug myself.. Grips are Cool Hand IIRC. P01 shoots about the same I just don’t have a target saved to photobucket for some reason.